Initial Design Appointment A typical design session lasts around one hour, during which time we will work together to come up with an original design. The process is interactive and clients are encouraged to bring in any images or ideas they have to inspire the process. We believe that the design process should be fun, and the results reflect your style and sensibilities. Once the design has been established we can give you a estimate and move forward to the next step. 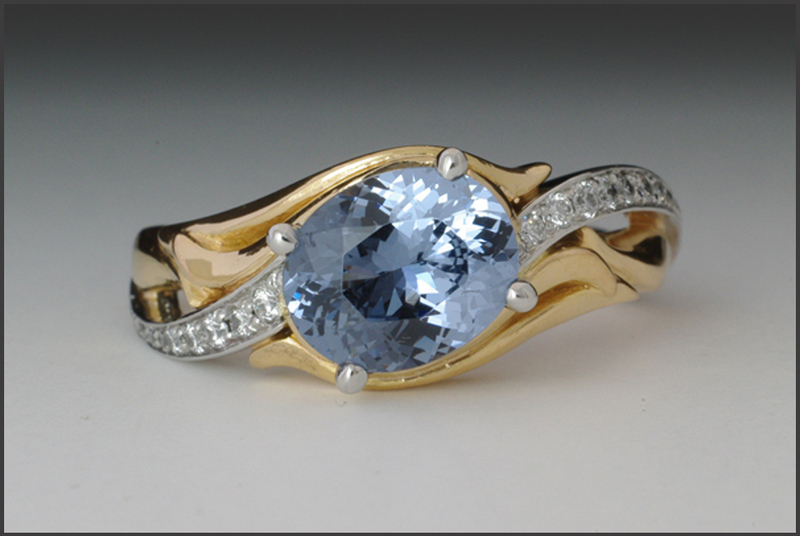 Stones Part of the design process is bringing clarity to the way that diamonds and gemstones are graded and sold. Precious gems are natural minerals with individual characteristics that make each one unique. The perfect stone is the one that is perfect for you, so after we talk about your needs and priorities, and we will bring in a small curated selection and help you to choose the best one. Model Review Most designs are made using the lost wax casting process, a technique thousands of years old that involves carefully carving an accurate scale model of the object in wax. We invite our clients to review the wax model to ensure that we share the same vision for the piece, and that everything feels right. After the model is approved, we accept a 50% deposit and complete the work. Although we still prefer to hand carve most of our waxes the traditional way, there are times when 3-d modelling and printing a wax is the best way to go. We have years of experience in bringing the most demanding designs to life, using the tools and techniques that best convey the desired character and feeling. Can you melt down my old jewellery to make something new? Yes, to a degree. Every casting requires some new gold to ensure a quality cast and unfortunately white gold does not recast well. If your old gold is yellow gold, I can reuse some of it in the new piece, and will give you credit for the remaining gold regardless of its colour or purity. Will you set stones that I provide in a new piece? Yes, I often reset customers stones as long as they are not cracked or broken. Redesigning can be a nice way to make a sentimental piece or heirloom suit your personal style better. It is important to note that diamonds from separate pieces are often slightly different in colour tone which may affect how you want to place them together. What is the customer stone fee? There is both a tangible risk that your stone could be damaged (chipped) during setting, and also a hidden financial risk if our reputation as a reliable stone setter is damaged along with a stone. Some of the retail mark up associated with purchasing a new diamond covers this tangible risk, and if the setter chips a stone the shop has only to eat the cost to replace it, and the profit from the sale eases the risk. However, when a customer brings in a stone, both risks are there, but the profit on selling a stone is not, and the reputational consequence of working with family heirlooms is understandably much higher. There is much debate within our industry as to how to deal with this; some shops have a flat fee regardless of stone value, some have full liability releases, many shops won't even touch a customer's stone. Flat fees aren't fair, liability releases don't cover the anger and disappointment a customer will have if the shop were to simply say "sorry", and not touching stones leaves people without good options. For years we have been very careful and optimistic that our setting skills were good enough as we passed the savings along to our customer. We can happily say that because Mr. Grund is very conscientious, we are still in business and enjoy a good reputation in a small city. But as the reputation of the shop grows, so too have the value of the stones people entrust us with. It is simply irresponsible to be on the hook for so much with no back up plan, as some of the stones we work with may bankrupt the store should we have to replace one. Our solution: We look up what the estimated replacement value of your stone is based on our experience and sites such as the IDEX Diamond Retail Index. We charge a small percentage (approx. 3%) of the stones value so we are able to replace it with something equivalent should the stone be damaged or lost while in our possession. This fee is essentially our own internal insurance plan to protect us both. Is custom jewellery expensive? While custom made things cost more than than mass-produced ones, you are also getting more. You will work personally with the designer/maker to create a unique design from scratch, where you decide the quality, budget, shapes, colours and materials used. You are supporting creativity and individualism in your community and the growth of your local economy. There are many good reasons to choose custom and it may cost less than you think! Do you repair jewellery? We no longer repair jewellery that is made outside our studio in order to dedicate our time to original works.